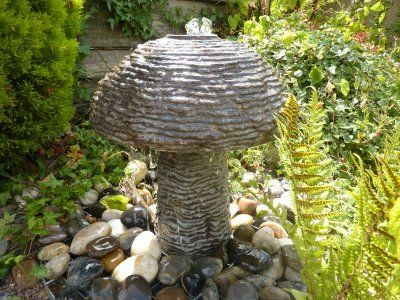 The hand crafted shape of the Cascading Mushroom Water Feature is particularly satisfying as a garden focal point, with its distinctiveness emphasized by the rich naturally occurring hues of the granite material.. The water feature's fulsome appearance and vibrant colours make it a unique piece, individual in character and not likely to be replicated. Each piece is different and has natural qualities that that differentiate it from any other. Although perhaps inspired by classical forms, the feature is ideal in a contemporary setting, vividly at home as a centrepiece with water enriching its colour variations. Outstanding durability is also a very notable quality, with its greys, blacks gleaming throughout many summers under the influence of the flowing water. All our Water Features come complete with reservoir and water pump kit.